Things are going from bad to worse at Vivendi. The embattled French company’s Universal Music arm on Friday offered to sell over a quarter of EMI Music’s business to appease European trustbusters scrutinizing the $1.9 billion transaction. That could wind up more expensive than if the EU just blocked the acquisition outright. Vivendi struck its unexpected deal for EMI last November under since-ousted Chief Executive Jean-Bernard Levy. It was so iffy competitively that Citigroup, which had seized overleveraged EMI from buyout firm Terra Firma, forced Universal to absorb the regulatory risk. Vivendi must fork over 90 percent of the price tag in early September, regardless of whether it has approval. After months of haggling, Universal, already the world’s largest music company, proposed offloading EMI’s famed Parlophone label, whose artists and catalog include Coldplay, Lily Allen and Pink Floyd – though it wants to keep the Beatles. Classical music and operations in France and elsewhere also would go. All told, Universal is willing to sacrifice some 360 million euros ($440 million) of recording, merchandising and other revenue. That’s 28 percent of EMI’s 1 billion pounds ($1.6 billion) of sales in the year to March 31, 2011. EMI’s EBITDA over the same period was about $260 million and Universal anticipated $160 million of annual cost savings. Assuming profit and synergies are proportional to revenue, the businesses Universal would retain are worth about $530 million less than the deal price. Universal is paying about seven times EBITDA for EMI, or 4.5 times adjusted for synergies. If it could dispose of the requisite EMI pieces for 4.5 times EBITDA, it would recoup about $330 million. Net, Universal would be about $200 million out of pocket. The downside for Universal, however, could easily be much larger. This is just the first pass with the EU and U.S. regulators haven’t weighed in yet. The envisioned cost cuts also are apt to be disproportionately in the operations Universal will have to sell. Should it end up shedding 40 percent of the EMI business and losing 60 percent of the synergies it hoped for, the hit would be well over $400 million. If EU regulators instead nixed the deal, Citi would auction EMI again. A new sale at six times EBITDA would bring in under $1.6 billion. Vivendi would collect that amount and never pay the last 10 percent of the original price. Overall, the French group would be out nearer $150 million, excluding the cost of lawyers, time and humiliation. For a conglomerate in crisis, it would be a less costly outcome. 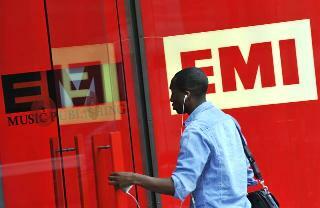 A man enters EMI offices in west London. Last week, Citigroup took control of EMI through the largest pre-pack administration seen in the UK. Vivendi’s Universal Music on July 27 offered to sell a big chunk of EMI Music to win EU clearance for its $1.9 billion proposed acquisition of its British rival. Universal said in documents submitted to European regulators that it would unload the bulk of Parlophone as well EMI Classics, EMI France, EMI Norway and other operations. These assets account for about 360 million euros of EMI’s recording and other revenue, according to people familiar with the plan. EMI had 1 billion pounds of revenue and 170 million pounds of EBITDA in the year to March 31, 2011, according to the latest publicly available figure, from Universal’s deal presentation in November 2011.